Do you like historical fiction? Are you interested in World War II? Would you just like to read an amazing book? Well then, The Book Thief is the book for you! 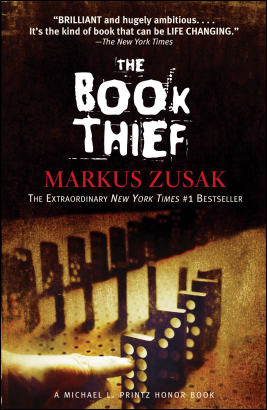 Set in 1939 in a small town called Molching, Germany during the Holocaust era, you get a story full of love, loss, horror, excitement, and thrill called The Book Thief, by Markus Zusak. In the story, the book thief herself, Liesel Meminger, steals her first book, The Grave Digger's Handbook, at her little brother's graveside. This one small action leads to much more thieveries. Separated from her mother forever, Liesel moves to Himmel Street with her foster family, the Hubbermans, and her life changes forever. Her addiction to words and books begins to take off from there, and she soon is stealing books from Nazi book burnings and the mayor's library. With the help of her accordion playing foster father she learns to read. At this point in time, the country, and especially the Jews, are holding their breath. The Hubbermans hide an extraordinary fist fighting Jew in their basement, desperate for this innocent man to survive and live without suffering. Liesel's eyes are opened wide and she soon learns more about the horror and tragedy that is World War II. Can her family keep the secret forever? Will Liesel's book thievery continue? You'll have to read to find out. The Book Thief is one of the best books I've ever read in my life. I discovered so much about the WWII era and all the horrible things that happened. This novel has a very unique narrator - Death. Yes, Death himself, the grim reaper, you could say. During this time period, Death was very busy, collecting all the innocent and evil souls that were lost during the war. He tells us the story of Liesel Meminger, leading up to the time he finally meets her. Her story is captivating, devastating, and most importantly, unforgettable. Liesel goes through so much throughout her life, losing so many people that she loves. But she still remains strong, stealing books and writing as a way to vent. All the characters are so real and loveable. Their experiences could happen to anyone and their pain is portrayed so well. Markus Zusak has so much talent as a writer; he keeps you hooked into the story all the way through. I was never bored - it was hard to put this book down. The Book Thief even brought me to tears, which rarely ever happens. The Book Thief is one of those books you are proud to hold in your hand and be seen reading. It deserves to be framed in a glass case, in my opinion. I am not the biggest fan of historical fiction, but I still fell in love with this novel. I highly recommend it to everyone, teenagers or adults! I rate The Book Thief 5 out of 5 stars.